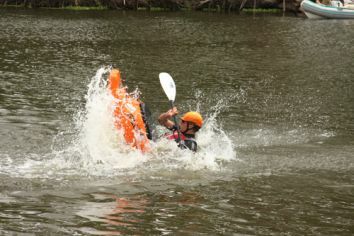 Freestyle kayaking in South Africa has been around for many years. From the middle 1990’s both the local and international competitive scene grew with leaps and bounds due to a revolution in kayak design which opened up a whole new world of what’s possible in a kayak. Much of the credit for this design revolution can go to South African born Corran Addison. Then in 2002 Celliers Kruger started up Fluid Kayaks in Parys. Freestyle was adopted as an official CSA discipline in 2003 and in 2006 it became an official discipline of the ICF. Events are held on stationary river features like holes and waves. On the social side, it’s all about fun and just enjoying your time on the feature. On the competitive side, paddlers have a set time in which they must perform as many different moves as possible, with each move having a certain score. The more difficult the move, the bigger the score. Paddlers also get extra points for linking moves into each other, getting airborne (some moves require being airborne in order to perform it) or going huge. Some moves are only possible on waves and others only in holes. 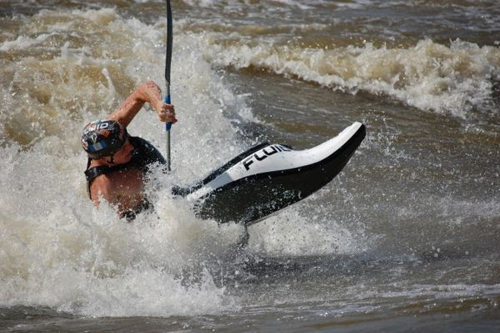 The main event on the local scene is the annual NFKC weekend held in November at the famous Gatsien wave on the Vaal River. This event serves as the selection for the SA squad but is also about the pro paddlers helping out the youngsters and less experienced. Various other events happen all year round all over SA.